Roofs are the most important part of a home's weatherproofing -- a leaking roof can cause incalculable damage in a relatively short period of time. 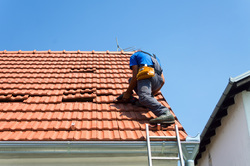 Often times it is difficult to find a roofer for roof repairs, and it is often necessary to replace a roof rather than repairing it. Most roofs today last 20-30 years, though certain custom roofing materials may have longer or slightly shorter life spans. Built-up roofs, tar & gravel, bitumen, foam, etc. To melt snow, ice & prevent ice dams. Applying chemicals that seal a roof & extend its life.